Dentistry, a lucrative profession, is concerned with all health problems afflicting the mouth, teeth, gums and other hard and soft tissues of the oral cavity. Dentistry as a career has many specializations. The prominent clinical categories are Orthodontics (straightening and aligning of teeth and jaws), Periodontics (care of gums and the diseases that might afflict them), Pedodontics (Pediatric dentistry dealing with children), Endodontics (root canal jobs and fillings), Prosthodontics & Maxillofacial Prosthodontics (involves the making of artificial teeth), Oral and Maxillofacial Surgery, and non clinical categories include Oral Medicine and Radiology, Oral Pathology (deals with the diagnosis of diseases that affect the mouth), Community Dentistry, Forensic Odontology, Dental Material Science etc. 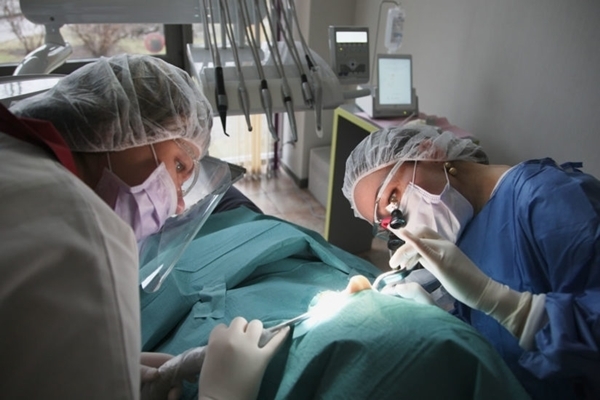 Here we discuss in detail about the branch Oral and Maxillofacial Surgery. Oral and Maxillofacial Surgery is an exciting and challenging specialty of Dentistry that combines dental, medical, and surgical knowledge and skills. Purely a surgical branch, it deals with diagnosis and surgical treatment of diseases affecting the mouth, jaws, face and neck. Oral and maxillofacial Surgeons i.e dental specialists who specialise in the field of Oral and Maxillofacial Surgery, are referred to do simplest surgical procedure of tooth extraction to complex procedures that require extensive surgery. They perform surgeries on the oral (mouth) and maxillofacial (jaws and face) areas in order to improve function, appearance and/or to correct defects, repair injuries, or treat diseases. Oral and maxillofacial surgeons care for patients who experience such conditions as problem of wisdom teeth, facial injury, dental implants and misaligned jaws. They will also do minor cosmetic procedure for patients. These surgeons need a great degree of expertise and medical knowledge to evaluate the general health of the patients who undergo surgery as well as to handle any medical emergency arising during the procedure. Oral and maxillofacial surgeons may work in combination with restorative dentists, orthodontists, prosthodontists or other dental and medical professionals to develop and execute treatment plans. To work as a dentist one needs only Bachelor's degree in Dental Science (BDS). If you want your career to grow, then you have to to be a specialist with a Masters (MDS) degree of 3 years duration. i.e to become an Oral maxillofacial surgeon, you have to go for MDS in Oral Maxillofacial surgery. Candidates who have passed 10+2 with Physics, Chemistry and Biology, with at least 50% marks are eligible for admission in the Bachelor of Dental Science (BDS) course. BDS admission is based on entrance test. Those who have completed the BDS should be registered to practice dentistry by the Dental Council of India. Further to get specialised you have to opt for Masters in Dental Science (MDS). Selection is based on the marks of BDS marks and the score you get in the national, state or deemed university entrance tests. The foremost attribute required for a good dentist is patience, stamina to work hard for long periods, good health, concentration, manual dexterity and accuracy. Besides these they must have a keen eye for detail, ability to memorise and recall scientific facts, comprehensive medical understanding, cool temperament and strong interpersonal skills. The best dentists are skillful communicators and their analytical and logical reasoning skill should be above average. You should be able to put people at their ease, gain their confidence and deal sympathetically with their problems and fears. The scope of the specialty is large and includes the surgical and non-surgical management of conditions of the hard and soft tissues of the face, jaws and neck. There is a vast career opportunity for an Oral maxillofacial surgeon. The majority of job opportunities for a postgraduate in this field are available in research institutes, colleges, universities and hospitals. Those interested in teaching can acquire teaching jobs in any of the top Dental Colleges. They are eligible to hold positions as professors or even HOD and even get promoted as Dean. Oral Maxillofacial surgeon can get employment in Oral maxillofacial department of reputed hospitals, chances are there in both private and government hospitals. Trained private practitioners can setup their own dental clinic. Opportunities also lie in the area of forensic science. They also can also get job in Armed forces and railways. Apart from a job in a hospital or setting up your clinic, you could also work in the Research and Advisory functions of a pharmaceutical and other company producing oral care products and medicines like toothpaste, mouth wash, gum care products, etc. The salary of an Oral maxillofacial surgeon is based on factors- such as skill and work experience, education level, type of employment and the geographical area. A fresher in the field can earn Rs. 9,000 upwards. Dental surgeons can earn good money through their own practice. The consultation charges could be Rs.500 upwards. They can even charge depending upon the nature of dental problem the patient is undergoing. Even for simple case of a wisdom teeth, Oral maxillofacial surgeon charge Rs. 2000 and above. A well established dentist can make around Rs. 60,000 - 1,00,000 or more per month.